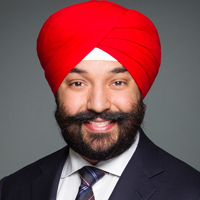 Navdeep Bains was a distinguished visiting professor at Ryerson University’s Ted Rogers School of Management and holds an MBA with a specialization in Finance. As a Certified Management Accountant, he has worked several years in accounting and financial analysis for the Ford Motor Company of Canada. Navdeep is a long-time resident of both Mississauga and Brampton and has strong ties to the social and cultural associations of Mississauga–Malton. Navdeep has been active in a variety of community organizations, as a board member for the Mississauga Food Bank, having worked with the Juvenile Diabetes Research Foundation and the Guru Gobind Singh Children’s Foundation, as well as having served as an Ontario board member with the Heart and Stroke Foundation. He is the recipient of a number of awards recognizing his work in promoting diversity within his community. Having served as the Member of Parliament for Mississauga–Brampton South from 2004 to 2011, Navdeep gained extensive experience as the Parliamentary Secretary to Prime Minister Paul Martin and as the Critic for Public Works and Government Services, the Treasury Board, International Trade, Natural Resources, and Small Business and Tourism.